Information Literacy Weblog: Abstracting: flipped classroom? On Tuesday I did sessions on abstracting with students here in the Information School, and as I was walking over to the first classroom it occurred to me that the way I was working could be called a flipped classroom. Since I posted the slidecast I used on Slideshare, I thought I would also share the activities that I did and then reflect on Flipped Classrooms. Firstly, the activities. Students had been asked to view the slidecast, to read an article on information encountering and to take some notes on the article (prompted by questions like "what methods did the author use in her research"). There is also handout which gives examples of different kinds of abstract. The whole class is about 90 students (the majority from outside the UK), and for this session we divide them into 4 groups, so there is more opportunity for them to ask questions and discuss. The session is 75 minutes. I produced a video telling them how to get to the right rooms, which seems useful at this early point of the year (it has cut down the number of people coming in late or not at all). 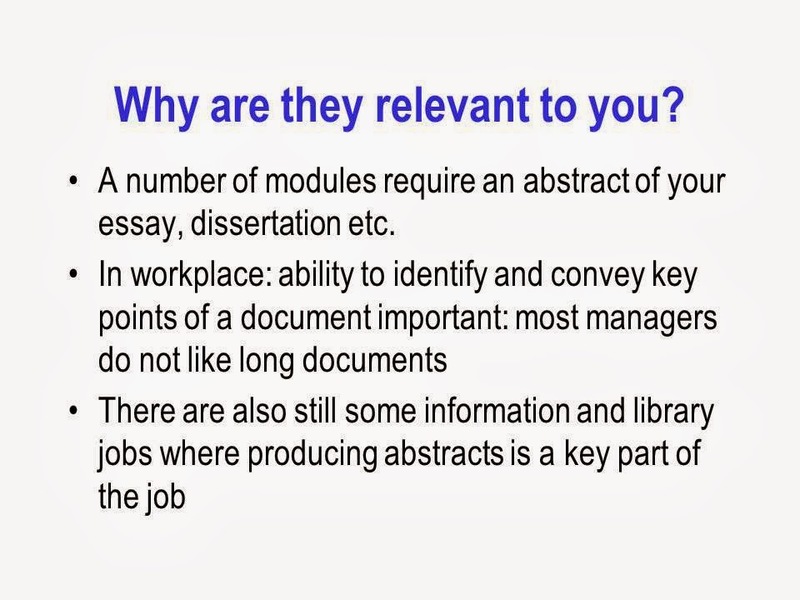 Firstly I spent a few minutes reminding them of the key points of the slidecast: i.e. 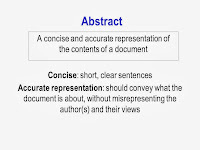 that I had defined an abstract as a concise summary representing a document, that I had explained why learning to abstract was useful, that I distinguished between three types of abstract and went through a process for abstracting. Then I asked them to discuss in twos and threes what they thought the difference was between an indicative, informative and structured abstract (for 5 or 10 minutes). After this I asked for volunteers to explain some of the differences, and also to raise any other comments or questions. The next step was to ask them to draft an abstract for the article they have read, dividing up the room so that some are doing indicative, some informative, and some structured abstracts. I allowed about 25 min for drafting: this isn't long enough for everyone to finish an abstract, but it is (I think) long enough for people to get an idea of the effort abstracting needs and gives them some experience of abstracting if they haven't had it already (which most people haven't). 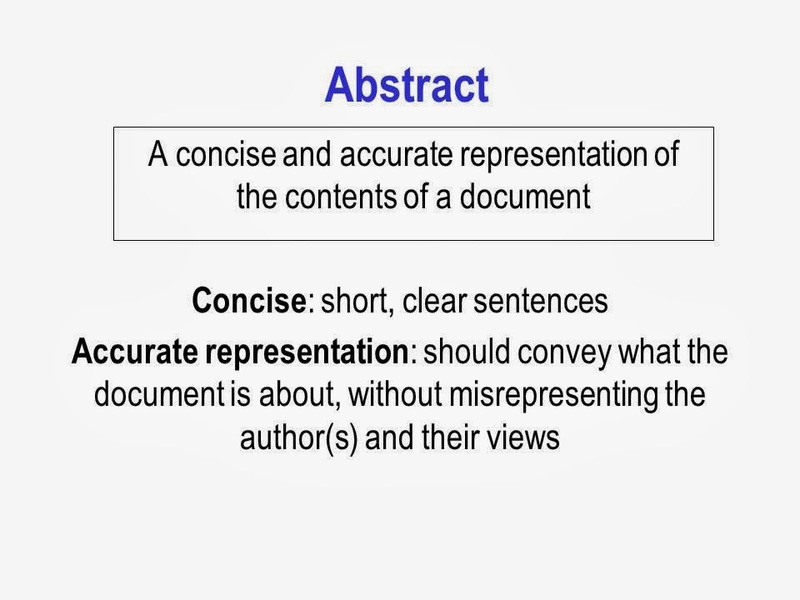 The next stage (about 10 minutes) is for each student to swap abstracts with a neighbour, read the neighbour's abstract, and comment on it (e.g. one good feature and one thing that needs improving). Where people have not written very much, I encouraged also discussing with their neighbour what was challenging (or enjoyable) about abstracting. The final stage was an open discussion. I asked for any criticisms of the article itself first of all (as problems in structure, poor style and omission of key information make it more difficult to abstract) and people are always able to identify issues with the article that DO make it more difficult, which leads into talking about what is difficult about abstracting. 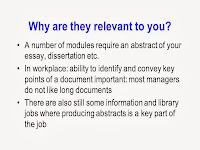 Then final questions usually include specific ones about the abstracts they have to write as part of their coursework and dissertations, and more general questions to do with abstracts, academic writing and reading, and also information behaviour (which is the subject of the article). I really do think an abstracting activity is useful: it gives practice in writing and also in reading (concentrating on what is the author aiming to say and how is he/she saying it, which you need to understand before you can produce your own perspective or critique). Anyway on to the Flipped classroom. EDUCAUSE has produced one of its useful "7 Things" sheets on flipping, here: http://net.educause.edu/ir/library/pdf/eli7081.pdf. I have avoided talking about flipping, partly because I can't see how getting-students-to-do-stuff-before-a-class is a new idea, or how watching a talking head on a video is "active", and partly because I get irritated when people downplay the problems and exaggerate the benefits. For literature classes (for example), even at school, preparation followed by inclass discussion is a familiar model, however I do realise that a transmissive model is more common in some other subject disciplines. - how you deal with people who come along without having done the activity. The last issue is one you have to plan for particularly carefully. I do not tell people who admit to not having done preparation to go away (which one person I know said they did), but you also don't want those who have prepared to feel that they are "carrying" those who haven't. For example, for a class I used to take with a colleague of mine, every week a few students had to give short presentations on aspects of an article that everyone was asked to read. So that people could not withdraw from contributing even if they had not read the article, we gave a few minutes after the short student presentations, in which time students had to think of a question either about the article itself, or a question to one of the student presenters. I don't usually actively solicit comments, but if anyone has comments on flipped classrooms, I'd be interested to hear them.